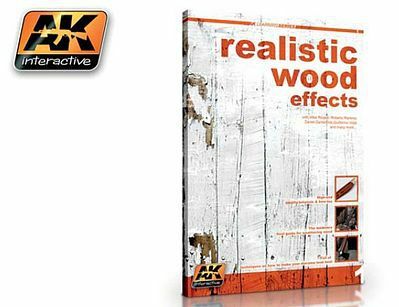 This is the Realistic Wood Effects Book by AK Interactive. Retail $24.99 SAVE 20% ! "Poor text, excellent photographs, achievable results." AK Interactive&apos;s Realistic Wood Effects is not simply an advertisement, or accompaniment, for the company&apos;s own products. Printed on high gloss [drool resistant] paper, the book contains 84 pages of step by step instructions for 15 different projects when modeling realistic wood. The projects cover a wide array of subject matter ensuring that there is more than just a few usable tips or techniques no matter what your modelling genre. Planes, ships, or diorama, each technique is not singular in application. Shown is how to simulate wood in its many states from fresh cut to heavily aged and weathered. Also covered is painted and chipped wood as well as stained and varnished wood, The products discussed and/or used range from AK Interactive&apos;s own products to Vallejo Model Color to Life Color, and well beyond. The steps are from first to last which is appreciated as the one big drawback is the rather poor grammar can be distracting. With the non-native speaking grammar aside, the quality of the pictures and the start to finish steps, the average modeler will find it well within their reach to improve. Eighty plus pages with full color photos throughout. Shows step-by-step every technique for creating realistic wood effects for models. While the photography is excellent, the translation from Spanish to English by the author is atrocious. You can get the gist of what he is doing in his step by step illustrations usually, but sometimes it is downright confusing. I recommend the book highly, and I recommend the author use an editor on his next book that is fluent in english.